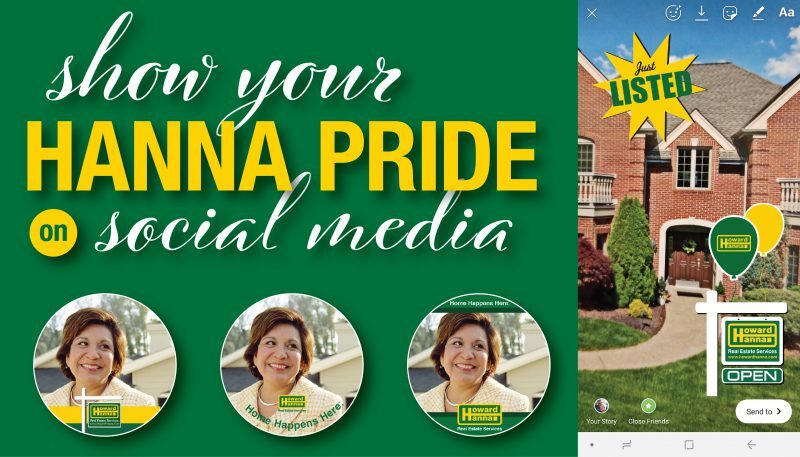 We’re offering Howard Hanna agents & customers a new way to express their Hanna pride with Instagram Story Stickers and Facebook Profile Frames! These new technological tools add some oomph to your social media presence. Get excited! Make a splash on Instagram and Snapchat with Howard Hanna’s new stickers! Powered by Giphy, these GIF stickers add movement to your stories. GIFs are small animations that can be found across the web and social media. Stickers are specialized GIFs with transparent backgrounds that you can add to photos and messages anywhere they are supported. You can find our new stickers anywhere the Giphy engine powers GIF stickers, which currently includes Instagram Stories, Snapchat, and even the Giphy Keyboard app for iPhones. On your Instagram home screen, swipe left. Take a picture, or upload one from the saved photos on your phone. In the search bar, type “Howard Hanna” to see our new stickers. Pick one to add to your story, and repeat these steps to add additional stickers! Advanced Tip: You can download your Instagram Story by clicking the downward-pointing arrow button before you post it. Then, share the video on your Instagram feed, Facebook page, or anywhere that video can be posted online. Explore all our GIF stickers by checking out our brand channel at Giphy.com/HowardHanna. Perfect your profile picture on Facebook with our new Profile Frames! These artistic additions let you customize your personal profile picture with the Hanna brand. You can set a time limit, or keep a Profile Frame on your profile picture indefinitely. Please note that they only work on personal profiles as of January 2019. Choose “Add Frame” and search for “Howard Hanna” to pick your frame. Voila! Now you can show your Hanna pride on social media, too! Go forth, and #GoGreen!